· Extended data logging and diagnostics. DataFLASH memory stores full 60 minutes of operating data at 10 samples/second. · Real-time and continuous auto-tuning with monitoring, control and override capability. No other commercially available system offers all these capabilities. For a more in-depth explanation of what this means and why it so important, please visit the TCFI Tech FAQ. · User friendly PC Link software with 3-D graphics and easy spreadsheet editing capabilities. For example, changing a block of cells in our advance table takes only a few mouse clicks. But don't take our word for it, check it out yourself. Download and play around with our PC Link TCFI software. Then try the same editing in the ThunderMax® SmartLink software and draw your own conclusions. · Built-in data logging. Competitive ThunderMax® systems lack built-in data logging. Without built-in data logging, it is almost impossible to diagnose real-world problems. Download our TCFI Log software and look at the sample data logging file. · Knowledgeable and prompt technical support. At Daytona Twin Tec, you can always reach a technician during normal business hours. You won't be told to send an email and wait for a response. In some situations, we may ask you to email us your current setup file and a data logging file that shows the problem, but an initial conversation is always with a trained technician. After hours and weekend support is available for racers. Visit the TCFI Tech FAQ for more detailed information about using the TCFI in performance applications! Wireless connectivity for our existing software. Requires laptop PC with Bluetooth capability. Windows 7 recommended. Required when using TwinView application on Android tablets. Instrument panel display showing all engine parameters. Facilitates initial tuning and diagnostics, especially on motorcycles without a tachometer. Requires Windows 8 tablet, such as the Acer Iconia W3 shown at left, and our Bluetooth interface. All of our tuning software will run on the tablet. Instrument panel display showing all engine parameters. Facilitates initial tuning and diagnostics, especially on motorcycles without a tachometer. GPS speed display allows quick speedometer calibration. Requires Android tablet, such as the Google Nexus 7 shown at left, and our Bluetooth interface. TwinView is third party Android application available on Google Play. Order online using Paypal or call us at 386-304-0700 (Monday-Friday 9 AM to 5 PM Eastern time) for credit card and COD orders. For online orders, please email any special instructions to sales@daytona-twintec.com. All products covered by our 1 year limited warranty. The TCFI kit includes the WEGO IIID dual channel wide-band exhaust gas oxygen interface that allows quick auto-tuning on a dyno or on-road during actual riding conditions. The kit includes Bosch LSU 4.2 wide-band sensors for both front and rear cylinders. The user programs a table with the desired air/fuel ratios - the system then does the rest. Competitive systems claim auto-tuning capability. Visit our Tech FAQ and find out why the TCFI system is superior. The TCFI solves tuning problems with highly modified engines. Competitive “band-aid” products that interface to the Delphi® controller still rely on speed-density fuel control. Long duration/high overlap camshafts wreak havoc with manifold pressure - especially at idle and cruise RPM. Speed-density based fuel control simply can’t cope. High-end automotive racing systems use alpha-N (throttle position and RPM based) fuel control. Alpha-N eliminates any dependence on manifold pressure and is unaffected by long duration/high overlap camshafts. The TCFI brings this proven technology to the H-D® marketplace. The TCFI has the same ignition control as our proven TC88/TC88A Twin Cam ignition systems with fully programmable advance curves. Idle air control including idle RPM and cold start characteristics are also fully programmable. This facilitates the use of throttle bodies modified for higher airflow. New H-D® motorcycles use the SAE J1850 data bus for communications between the engine control module (TCFI), instrument cluster, and turn signal/security module (TSM/TSSM). The TCFI fully supports the J1850 data bus. The TCFI also has built-in data logging that stores data for the last 60 minutes of operation at 10 samples/second. A USB interface and Windows compatible software allow the use of a laptop PC for programming and data analysis. 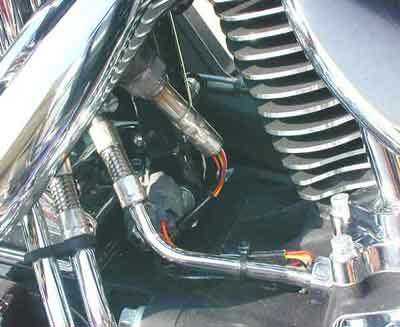 The USB interface plugs into the existing H-D® diagnostic connector on the motorcycle wiring harness. The TCFI is intended for high performance race engines that are expected to produce over 100 HP. The TCFI has been tested on engines up to 145 CID and 170 HP. We provide setup tables that will get you up and running. From a practical standpoint, tuning any fuel injection system requires an exhaust gas analyzer. You can either spend a lot of time on a dyno with an exhaust sniffer (like the newer Dynojet units) or you can use our WEGO. With the WEGO, the system will auto-tune the fuel tables while you ride the bike - you won't need to spend any time on a dyno. Auto-tuning under actual riding conditions only takes a few hours and gives much more realistic results that dyno tuning. 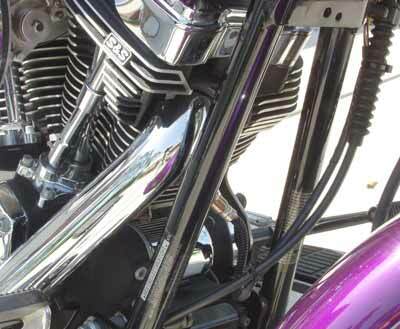 Air-cooled engines are very sensitive to thermal effects and dyno systems generally have inadequate cooling airflow. The TCFI EX is 50 states street legal (ARB E.O. No. D-641-5) for 2001-2006 88 CID Twin-Cam with 36 pin Delphi® system, excluding 2006 Dyna models with original equipment oxygen sensors. The TCFI EX is recommended for all street driven applications and allows retrofit of closed loop oxygen sensor technology to earlier models. There are only a few limitations compared to the standard race version TCFI. User changes to the air/fuel ratio table are only allowed above 2750 RPM or 35% throttle. There are also some limits on the range of user changes to the spark advance table. The programmable user input and output functions are not available. Refer to the TCFI Tech FAQ and the TCFI EX Installation & Tuning Manual for details. The TCFI system is race proven. Just ask Dan Hope of Nevada, MO who runs the TCFI on his 2005 Deluxe in the AHDRA ET class. Daytona Twin Tec can supply special TCFI units with speed-density firmware that supports turbo/supercharged applications with up to 3 bar (300 kPa) manifold pressure. The only required electrical modification to the motorcycle is that a Delphi 3-bar (40-304 kPa) MAP sensor must be installed in place of the OE MAP sensor. Higher flow rate fuel injectors and/or additional fuel injectors are also required for most applications. The TCFI system can drive up to four injectors (two per cylinder). The system also supports fuels such as E85. For more information, refer to the TCFI 300 kPa Speed-Density Firmware Tech Note. Additional materials including a fuel calculator are available on our download page. 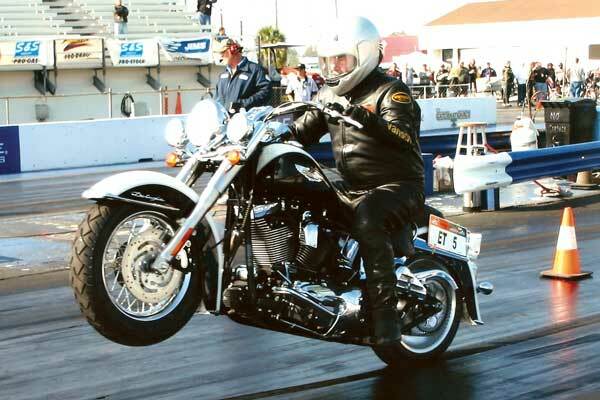 Tom Reiser of T-Man Performance uses the TCFI on his 225 HP supercharged bagger. He just set a new world record of 179.88 MPH in the AMA 1650/APS-PBG class at Bonneville during the 2010 Bub Speed Trials. Using the 300 kPa speed-density version of the TCFI fuel injection controller and SL-1 shift light system (from sister company Daytona Sensors), Jody Perewitz from Team J'Witz made a pass at 203.111 MPH during the 2011 Speed Trials by Bub® at the Bonneville Salt Flats Speedway. Jody became the first woman to go over 200 MPH on an American V-Twin. Her ride is based on a Daytec chassis using a 100 CID Jim's Twin-Cam with a ProCharger supercharger. Stacey Bortz competes in Hot Street in AMRA, racing out of Gregg's Machine Service/GMS Racing Engines. Her bike is a 120 CID EVO with custom crank trigger. She has gone as fast as 9.19 ET at 152 MPH in the quarter mile and she currently holds the Hot Street 1/8 mile speed record at 122.25 MPH. She is the quickest and fastest female in street shootout style H-D® drag racing. Thayer Sales (585-762-4705) offers a conversion harness, P/N CVN-1, that facilitates converting 2008-2013 touring models with electronic throttle control back to a mechanical twist grip and throttle body. This conversion allows installation of the TCFI on these models. Contact Thayer Sales for complete details. PC Link software runs under Microsoft Windows XP/Vista/7/8/10. We no longer support older Windows versions. PC Link allows the user to program all the engine control tables and parameters within the Twin Tec TCFI system. Minimum PC requirement is a 300 MHz Pentium with super VGA display (SVGA with 1024 x 768 pixel resolution). The TCFI connects to the PC by means of a USB interface. A USB cable is supplied with the unit. The PC must have a free USB port. For more details, please refer to our PC Link Tech FAQ. 3D tables are used for ignition advance and fuel control. Additional 2D tables are used for functions such as cold start enrichment and idle air control. Some sample tables are shown below. On 2004 and later models using the new J1850 data bus, the ECM (engine control module) converts signal pulses from the VSS (vehicle speed sensor) to data that is transmitted to the instrument cluster. Scaling (in terms of VSS frequency/speed) varies slightly between models depending on tire size and gear ratio. You can use PC Link software to change the default scaling and recalibrate the speedometer/odometer. For more detailed information, we suggest that you download the software and instructions. The TCFI also features a user input and user output that can serve various functions (not available on TCFI EX version). The user input can be configured for data logging (such as the status of a switch), ignition retard, ignition kill (for air shifter), or stage RPM limit. The user output can drive a relay and be configured as a general purpose RPM and throttle position based switch or to trigger an NOS system. PC Link software is free! You can always download the latest version of the software and instructions (contained within the TCFI Installation & Tuning Manual) from our website. The software will run in demo mode without a TCFI system attached. For your convenience, we include a copy on CDROM when you purchase the TCFI system. The TCFI features comprehensive data logging capability. During dyno testing, you can display real time engine data on an instrument panel type screen. The TCFI stores data for the last 60 minutes of operation at 10 samples/second. You can download and display this data on a chart recorder type screen. Data is available for all sensor inputs and output functions. The TCFI data logging capability greatly facilitates fine tuning and diagnosis of driveability issues. The data logging software, TCFI Log, has the same PC requirements as described above for the PC Link software. For more detailed information, we suggest that you download the TCFI Log software and instructions. The software download includes a sample file with actual data. The data logging software also allows you to download operating statistics and historical diagnostic codes. Downloaded operating statistics are displayed as shown below. Total hours represents the total time that the engine was running. ID represents the firmware identification. This field typically includes the manufacturer (Twin Tec), model number, program revision and author's initials, and date. Elapsed time is displayed for 13 RPM bands from idle to 6999 RPM. The utility also displays the maximum engine RPM, time at the RPM limit (in seconds for better resolution) and the number of engine starts. All this data can be printed to provide a permanent record. The data stored in the module for maximum engine RPM and time at the RPM limit can be cleared. All other elapsed time and engine starts data is permanent. Any historical diagnostic codes logged by the TCFI are listed along with the number of trips (engine start cycles) since the individual code was last logged. The software can also clear diagnostic codes. The elapsed time data in the various RPM bands can be displayed in the form of a histogram chart by clicking on the Histogram button. Clicking on this button causes the chart shown below to appear. Color coding of the bars helps to interpret the data. The idle RPM band is blue, normal operating RPM bands are green and high RPM bands are yellow and red. The chart is automatically scaled for best display. TCFI Log software is free! You can always download the latest version of the software and instructions (contained within the TCFI Installation & Tuning Manual) from our website. The software will run in demo mode without a TCFI system attached. For your convenience, we include a copy on CDROM when you purchase the TCFI system.